This is the new Hozu Bridge in Kameoka city,Kyoto. The new Hozu Bridge was opened to traffic in November of 2001. 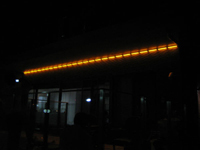 It utilizes 13,246 LEDs but the power consumption is the same as 20 pieces of a 100W light bulb. It is controled by a MCU to emit Rainbow colors. It shows “Redleaves” “Snow” “Blossoms” and “Sunflowers”. 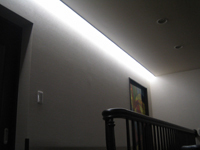 The porch and the living room are illuminated by concealed LED lighting.